A hot marketing area in today’s economy is physical gold and silver, in the form coins and bullion. Coins can be collectibles, or can function similarly to bullion bars – as a means of holding the precious metal itself. SalesLeads.tv sells lead lists to purveyors of rare or uncirculated gold and silver coins and of precious metal bullion in the form of bars or coins. We do not sell lists to OTC leveraged precious metal brokers, for reasons described in a previous blog. Numismatics: The study or collection of money. Numismatic value of a coin is based on its rarity and condition. Technically, it is the value of a coin in excess of the value of the metal it contains (setting aside shipping, handling, sales tax, etc). The word itself comes from the Latin word for “coin”. Coin collecting has been going on for millennia – the ancient Romans practiced it at the time of Caesar. Coin collectors got their first printed book on the subject in 1514. Modern-day numismatics deals with coins struck by machines by a private or governmental mint. Of special interest are rare varieties, mint-made errors and topical coins. Numismatists consist of coin brokers and their clients. Expensive collections of numismatic coins are often donated to museums or sold at auctions. Bullion: This is a bulk form of a precious metal: gold, silver, platinum or palladium. As such, it trades as a commodity, and there is no premium for numismatic quality or face value. Bullion can be purchased in ingots (bars) or as minted coins. Price does vary with the purity of the metal. The normal standard is 99.9 percent pure (24-carat). The highest purity gold coins are the Canadian Gold Maple Leaf series, with a purity of 99.999 percent. It is not possible to get 100 percent pure bullion, due to the unavoidable presence of trace elements. The attraction or gold and silver bullion in the form of coins is its ubiquity, quality standards, transportability, and if in the unlikely event of a total collapse in metal prices, coins are still worth their face value. The US Mint sells over a million ounces of gold coins every year. In other words, the market for physical gold and silver is huge. SaleLeads.tv is happy to provide marketers of the physical metals with lead lists that will identify potential customers. 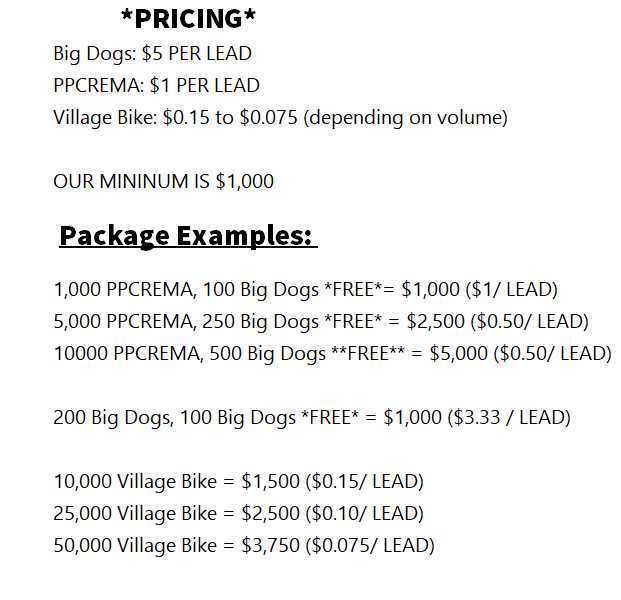 Most of our leads have been qualified for at least $10,000 and have been sent a package on precious metals.